Bodhi (Pāli and Sanskrit. Lit. awakening) is a title given in Buddhism to the specific awakening experience attained by the Indian spiritual teacher Gautama Buddha and his disciples. It is sometimes described as complete and perfect sanity, or awareness of the true nature of the universe. After attainment, it is believed one is freed from the cycle of Samsāra: birth, suffering, death and rebirth. 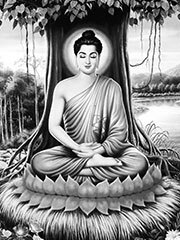 Bodhi is most commonly translated into English as enlightenment, though this translation is problematic, since enlightenment (the soul being «lit» by a higher power) is originally a concept from Christian mysticism or conversely evokes notions of the 18th century European Age of Enlightenment that are not identical with the Buddhist concept of Bodhi. There is no image of «light» contained in the term, «Bodhi» — rather, it expresses the notion of awakening from a dream and of being aware and Knowing (Reality). It is thus preferable to think of Bodhi as spiritual «Awake-ness» or «Awakening», rather than «enlightenment» (although it is true that imagery of light is extraordinarily prevalent in many of the Buddhist scriptures). Bodhi is attained only by the accomplishment of the Paramitas (perfections), when the Four Noble Truths are fully grasped, and when all karma has reached cessation. At this moment, all greed (lobha), aversion (dosa), delusion (moha), ignorance (avijjā), craving (tanha) and ego-centered consciousness (attā) are extinguished. Bodhi thus includes anattā, the absence of ego-centeredness. The Bodhi tree is a specimen of the Sacred Fig (Ficus religiosa) in what is now the town of Bodhgaya. It was while sitting in meditation under this tree that Siddhartha Gautama became enlightened. In the legends of Mahayana Buddhism, it was said that Queen Maya held a branch of one of these trees while resting in Lumbini Garden and her son, Siddhartha, was born. Those who study the teaching of a samma-sambuddha and then attain enlightenment in this world are known as Arhats. Such beings are skilled at helping others to reach enlightenment as they may draw on personal experience. Those who obtain enlightenment through self-realisation, without the aid of spiritual guides and teachers, are known as pratyekabuddhas. According to the Tripitaka, such beings only arise in ages where the dharma has been lost. Their skill in helping others to obtain enlightenment is inferior to that of the arhats, but one need to accumulate paramis in a much long time to become a pratyekabuddha than an Arhat. Many pratyekas may arise at a single time. When you get to this, then thoughts become still without being stilled, calmness and insight arise without being produced, the mind of the buddhas appears without being revealed. To try to liken it to the body of cosmic space or the light of a thousand suns would be to be further away than the sky is from the earth. To be a living being is not the ultimate state; there is something beyond, much more wonderful, which is neither being nor non-being, neither living nor not-living. It is a state of pure awareness, beyond the limitations of space and time. Once the illusion that the body-mind is oneself is abandoned, death loses its terror, it becomes a part of living.